The idea of cost-competitiveness for renewable energy resources—called “grid parity”—is misleading and incomplete without considering reliability. Yet recent reports are pushing grid parity as an imminent reality. For example, a February 2016 study from GTM Research assessed that electricity from residential solar has attained grid parity in 20 states. How an electricity source functions on the grid is more important than mere cost-competitiveness. To reach true grid parity, an electricity source should provide affordable, reliable power on a dependable basis. The National Renewable Energy Laboratory describes grid parity as the “break-even” cost for electricity from a renewable energy source in relation to “electricity purchased from the grid.” In other words, grid parity is attained when an energy source, such as solar power or wind energy, reaches cost-competitiveness on the electric grid with conventional sources of generation such as coal and natural gas. Nevertheless, strictly focusing on the cost of electricity ignores other important factors that affect an energy source’s relative value on the power grid. For instance, electricity supply and demand must be continually balanced to provide consistent, stable, and reliable power for American households and businesses. Consequently, most generation resources fulfill different roles on the grid, including baseload (for a continuous supply of electricity), intermediate (for following daily, predictable rises and falls in demand), or peaking capacity (for ramping up and down quickly to meet peak demand). Natural gas, coal, nuclear, and even hydroelectric generating units can effectively fill these various roles. Conversely, wind and solar are intermittent and only produce electricity when the wind is blowing or the sun is shining. Due to their inherent limitations, renewables are less useful for electricity generation than conventional sources. As a result, true grid parity should go beyond prices and consider the comparative functionality of various energy sources. The issue of being able to “dispatch”—or turn on or off—energy when it is demanded is an essential aspect of electricity generation that grid parity hardly addresses. Focusing merely on price competition ignores the crucial way that an electricity source functions on the grid and relates to other sources. Since renewables do not operate on the grid in an equivalent way to dispatchable electricity resources, true grid parity cannot functionally be achieved. As a result, grid parity is an empty concept because it ignores essential elements of energy generation: electricity sources should produce power predictably and reliably respond to demand. Plenty of research highlights the fundamental problems with renewable energy and casts doubt on its ability to achieve grid parity. Since EIA calculates only levelized electricity costs for new power plants, the Institute for Energy Research (IER) commissioned a study to facilitate more accurate comparisons between wind and other generation sources. The study found that electricity from existing coal-fired power plants is about three times less expensive than electricity from new wind facilities. The following chart from the report contrasts the affordability of different generation resources and shows that existing sources produce power less expensively than new sources. Additionally, the report calculated the “imposed costs” that wind power places on the grid. In essence, since intermittent generation forces dispatchable sources to operate less frequently and back down more often, existing power plants end up running fewer hours without any significant decrease in their fixed costs. The result is more expensive electricity. As previously economical power plants become more costly to operate, more of them will retire prematurely, potentially feeding a negative cycle of rising electricity prices. Generally, utilities pass on these higher costs to consumers. As intermittent sources make electricity more expensive, grid parity becomes easier to achieve. For example, subsidies have increased the amount of installed solar capacity in Germany, even though the country has relatively poor insolation (i.e., Germany does not have an optimal—or even good—environment for solar power). After passing major renewable energy legislation in 2000, German electricity prices have doubled and are the second most expensive in Europe. New studies and reports that assert renewable energy sources have reached grid parity are misleading because they ignore the fundamentals of operating the electric grid. In order for the grid to function properly, supply and demand must be continually balanced. Coal, natural gas, nuclear, and hydroelectric power are essential because they are predictable and dispatchable resources; conversely, renewables produce power intermittently and are less valuable as a generation resource. Cost and function should not be evaluated separately when considering grid parity. To reach true grid parity, an energy source should be able to produce affordable electricity as well as dependably meet electricity demand. Part II of this analysis will investigate government policies that have enabled renewables to attain grid parity and discuss why subsidizing renewables is mistaken. Paul Denholm, Robert M. Margolis, Sean Ong, and Billy Roberts, Break-Even Cost for Residential Photovoltaics in the United States: Key Drivers and Sensitivities, National Renewable Energy Laboratory, NREL/TP-6A2-46909, December 2009, p. 1, http://www.nrel.gov/docs/fy10osti/46909.pdf. 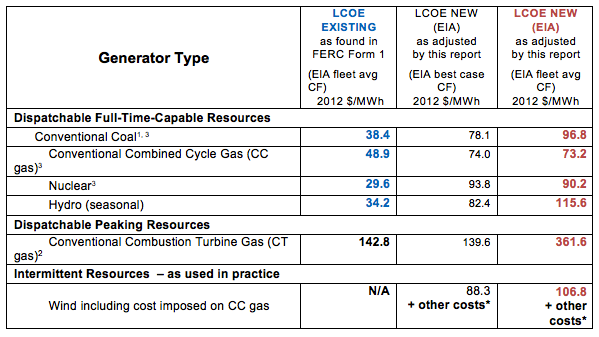 EIA, Levelized Cost and Levelized Avoided Cost of New Generation Resources in the Annual Energy Outlook 2015, June 3, 2015, http://www.eia.gov/forecasts/aeo/electricity_generation.cfm. Varun Sivaram and Michael Levi, Budget Deal Oil-for-Renewables Trade Would Substantially Reduce Carbon Emissions, Council on Foreign Relations, December 18, 2015, http://blogs.cfr.org/levi/2015/12/18/budget-deal-oil-for-renewables-trade-would-substantially-reduce-carbon-emissions/. Although IER’s study did not assess the LCOE of new solar PV, that source is most likely even more expensive than new wind resources. In fact, this supposition is supported by a Deloitte MarketPoint report, which determined, “Onshore wind is more likely to reach grid parity before utility-scale solar PV, under a wide range of assumptions.” See, Journey to grid parity, 2015, p. 1, http://www2.deloitte.com/us/en/pages/energy-and-resources/articles/journey-to-grid-parity.html. Institute for Energy Research, New Electricity Sources Still More Expensive than Existing Ones, July 15, 2015, http://instituteforenergyresearch.org/analysis/icymi-new-electricity-sources-still-more-expensive-than-existing-ones/. Thomas F. Stacy and George S. Taylor, Ph.D., The Levelized Cost of Electricity from Existing Generation Resources, Institute for Energy Research, June 2015, http://instituteforenergyresearch.org/wp-content/uploads/2015/06/ier_lcoe_2015.pdf. It would be clearer to me to use a word other than “cost” in that sentence. To me, “cost” in this context is from the producer side, meaning the cost to produce the electricity, i.e. “levelized cost” or “break even” cost. Less ambiguous terms for “cost” might be “average wholesale clearing price” or “price at which a solar producer can profitably sell their electricity into the grid system.” These are two different numbers, of course, separated by tax and ratepayer borne subsidy. I looked into the GTM policy report you cite. Who would pay $2,000 for an obviously biased report? What content might it offer a business that would justify that expense? The advertisement fails to even hint at what that might be. I am aghast that this GTM group even exists and might have a payroll to support it’s staff. Keep producing honest, irrefutable, unbiased work, Mark. Doing the right things for the right reason has got to win out eventually! A frequent criticism of this approach, one that I do not agree with, is that the costs do not include externalities like environmental damage from coal mining and burning. What I always point out to people is “nor should they”. We (the developed world) don’t control the worldwide supply of carbon (coal, oil, gas), and we don’t control the world demand for carbon. The countries that do must both mine and sell resources for economic reasons, or buy and burn those resources for economic reasons. For India to have electricity for all, it must REDUCE the cost of the electricity as low as possible. It does not have the option of paying 2-3 times the cheapest option. It doesn’t have the money for that, or rather, only 1/2 to 1/3 the population will get electricity. And the cheapest option is either domestic coal and gas. So the option of raising energy prices, or pricing carbon, simply does not exist for most of the world. They will continue to burn and pollute unless we give them something even cheaper than coal or gas. This is why so much of the renewable power rhetoric is so intensely misguided. People in the west can’t get it through their thick heads that what we do doesn’t matter, and that expensive, boutique energy is not going to solve the problem. Hydro, nuclear, and natural gas. It is the only path forward. Each has drawbacks, but then, what doesn’t?